Fear of being seen running on the roads or even on a treadmill at the gym keeps a lot of people from starting or continuing a running habit. You may be worried that you'll look slow, silly, too fat, too old to other runners or people driving by. Don't be concerned about what others think. As a runner, you deserve respect from other runners. Besides, runners love seeing others out on the roads or trails. We know how much enjoyment we get out of the sport, so why wouldn't we want to see other people doing the same thing? Also, remember that all runners were new to the sport at some point, so they can all relate to the struggles that beginners face. If you're worried about what non-runners think, try not to get too hung up on that. Just remind yourself of all the great benefits that you're getting from running and they're missing out on. And anyone whose opinion you care about (close friends and family members) are no doubt impressed that you're doing something to improve your health and fitness. Be proud that you're doing something good for your physical and mental health. Wearing the right clothes for running may make you feel more comfortable when running in public. For women, it's especially important to wear the right sports bra. You don't need to go out and buy five new running outfits, but a few key pieces—a comfortable pair of running shorts or pants and a sharp-looking running shirt, paired with the right running shoes—can really give you a confidence and motivation boost. You may also feel more confident about running if you are using the proper running form. Follow these tips for proper running form to learn how to look comfortable and at ease while you're running. Even if your form isn't perfect, you'll feel better knowing that you're working on it. You may also feel less self-conscious if you get a friend or family member to come along with you. An added bonus to running with a buddy is that you can keep each other motivated to run. You could also look for a local running group. 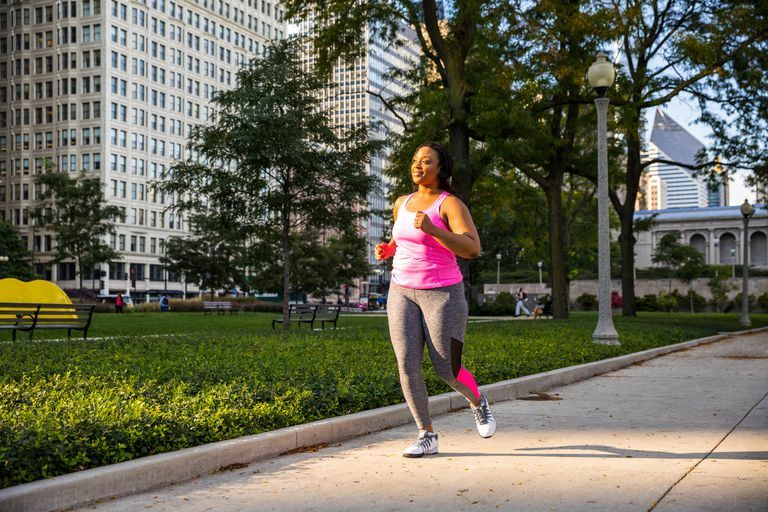 Check with your gym, local running store, or your town or city's recreation department to see if there are any programs for beginner runners. If you're running by yourself, follow these tips for running alone. If street harassment is a problem, try to ignore the person, hold your head high, and keep running. Yelling back or flipping him off will only exacerbate the situation. Running in public areas such as a park, bike path, or trail will reduce the chances of random people driving past you. Like anything else, the first time is usually the hardest. Once you've run in public a few times, you'll feel a lot more confident and comfortable, and be less concerned about others watching you.